HVAC 101: The Furnace | Chicago's Home Comfort Expert! In our last post, we discussed the positions for a central forced air HVAC system. In this article we will discuss the furnace and the major parts and pieces that go into the design and operation of a furnace. Let’s start at the bottom and move upward. The Blower – Sometimes also known as the fan, this part of the furnace moves the air throughout the duct system. The blower in the furnace is used to deliver both the warm air during heating season and cool air during the cooling season. Blowers or fans operate using either alternating electrical current, commonly referred to as a PSC motor, or direct electrical current, commonly referred to as an ECM motor. The fan can have a fixed speed or a variable speed. The type of blower that is installed will also effect the efficiency of the air conditioning system. Circuit Board – The brains of your heating and cooling system. The thermostat communicates with the circuit board and the circuit board communicates with the individual parts and pieces of the furnace including the blower, gas valve, ignitor, inducer motor, air cleaner and humidifier. When a circuit board fails, it’s usually an indication that another part is causing the circuit board to fail. The Burners – These create the flames that will heat the heat exchanger allowing the blower to deliver warm air. On old systems, there was a pilot light that would ignite the burners when fuel was pushed into the burners. Today a spark ignition or glow ignition is used. 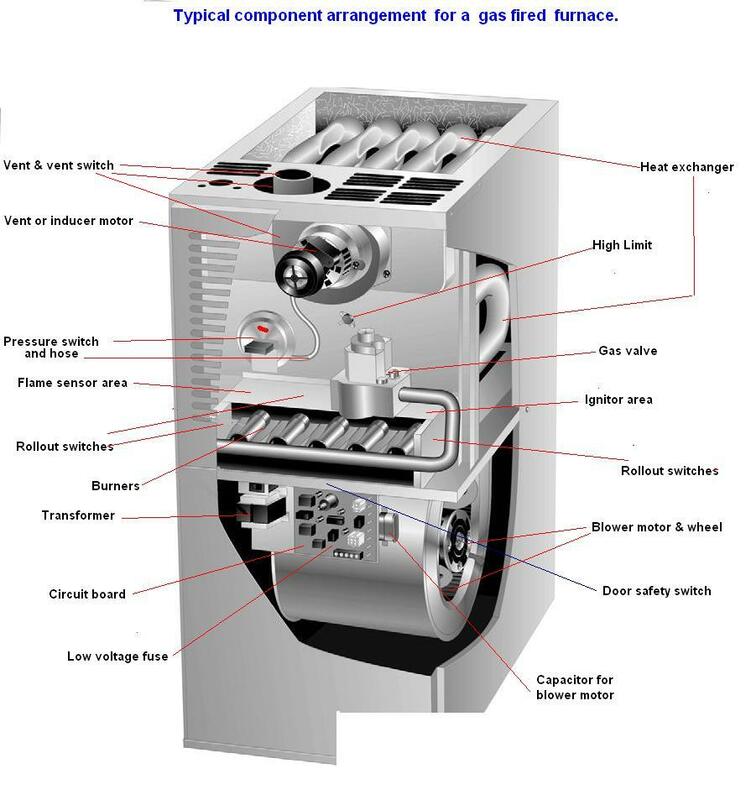 Heat Exchanger – The heat exchanger serves 2 purposes, one safety and one for comfort. For safety, this part of the furnace contains all flames and exhaust gasses to ensure they properly exhaust to the outside. On the comfort side, this part of the furnace creates heat for your home. As the heat exchanger warms, or gets incredibly hot, the blower pushes air past the heat exchanger, thus heating the air, before it is delivered through the duct system to warm your home. When you have a compromised heat exchanger, you have only 2 options, replace the heat exchanger or replace the furnace. Most reputable HVAC contractors and gas utility companies will shut your furnace down when you have a compromised heat exchanger. High Limit – A high limit switch is a safety device that prevents the furnace and heat exchanger from getting to hot. It is usually installed near the hottest point of the heat exchanger. When the area gets to hot, the high limit switch will shut down the operation of the furnace. A furnace going off on “high limit” could have a compromised heat exchanger, a failing inducer motor, a failing blower or blower motor or lack proper return. All parts on a furnace need to function at the maximum operational level to ensure your furnace works most efficiently. Any part of piece that is not functioning properly will decrease the efficiency of the furnace costing you more money on your monthly utility bill. This entry was posted in Chicago, Furnace, HVAC 101 and tagged blower motor, Chicago, Furnace, heat exchanger, heating, heating and cooling, home comfort, HVAC, inducer motor, scott toomey. Bookmark the permalink.